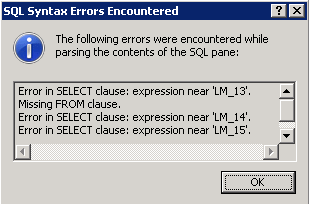 This Error Message Article explains the Microsoft SQL Server Management Studio error message “SQL Syntax Errors Encountered The following errors were encountered while parsing the contents of the SQL pane: Error in SELECT clause: expression near ‘[field reference]’. Missing FROM clause.” and details how to fix the underlying problem that caused it to appear. SQL is unable to execute the SELECT statement because it cannot find the field reference value in the FROM clause. In this case, there was a typo in the SELECT statement (missing a comma between field references) so SQL put the two references together and could not recognize the new, incorrect, statement in the FROM clause. Great care needs to be take in writing and executing SQL statements. In this case, a neglected comma needed to be added to the statement. Tagged: Error in SELECT clause: expression near '[field reference]'. Missing FROM clause.Microsoft SQL Server Management Studio ErrorSQL statement errorSQL Syntax Errors Encountered The following errors were encountered while parsing the contents of the SQL pane: Error in SELECT clause: expression near '[field reference]'. Missing FROM clause.